Just 5% of visitors will become a purchaser for the first time visit and explore their wanted product, especially this rule is more true for the CMS markets which always very complicated to give decision to buy. 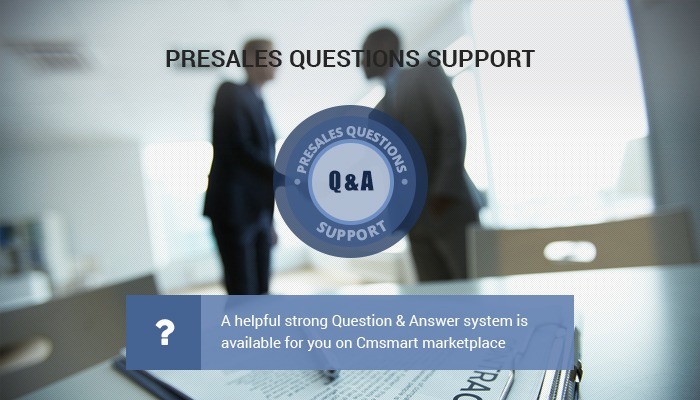 Understand that, Cmsmart Marketplace team has developed a very strong Question & Answer system for each product items, where the buyers can easily ask any questions, raise any concern about the products, to considers the reply from the developers, not only for the products features, but also to see how Customer Services Orientation the developer can provides. 1. It is possible for only Woocommerce. 2. We will note and update this request in the future so could you wait for us? I will send you the email when we release it. Each of my products will have different available dates to choose from so I need to set different excluded dates per product. Many thanks for your interest in our product. I am Vincent- my pleasure to support you in this case. I have checked your request with our dev team but if possible, can you send me an example ( i meant a real URL) so that we could understand how it displays and give you the best answer. -when you choose new variable product need to click on button "Clear All Design" to reset designer. It can be implemented so that the designer cleans himself when choosing a new product option. Many thanks for your question. I am Janet here, it is my pleasure to support you in this case. 1. In the current version, our product doesn't support template title. 2. We can make the customization for you. 3. Do you want to delete design when choosing a variation again? If yes, we can make the customization for you. If you have any question, feel free to contact me via email: janet@cmsmart.net for a quick discussion. Does the designer extension work with magento 2.3.x? I'm thinking to buy this plugin. My question is, If I get the standard version, will the plugin stop working after 6 months? I basically just need it for phone cases. I have replied you this question via email. Let me explain 2 types of payment for this plugin: Auto-renewal and Standard payment. With this type of payment, you will pay 179.69$ for the first payment. You’ll have 6 months to receive our support, download and upgrade FREE. Most of customers choose Auto Renewal Payment because it will save money and the site always updated and you can get our support if you have any issues.